This week we have been able to accomplish quite a bit. 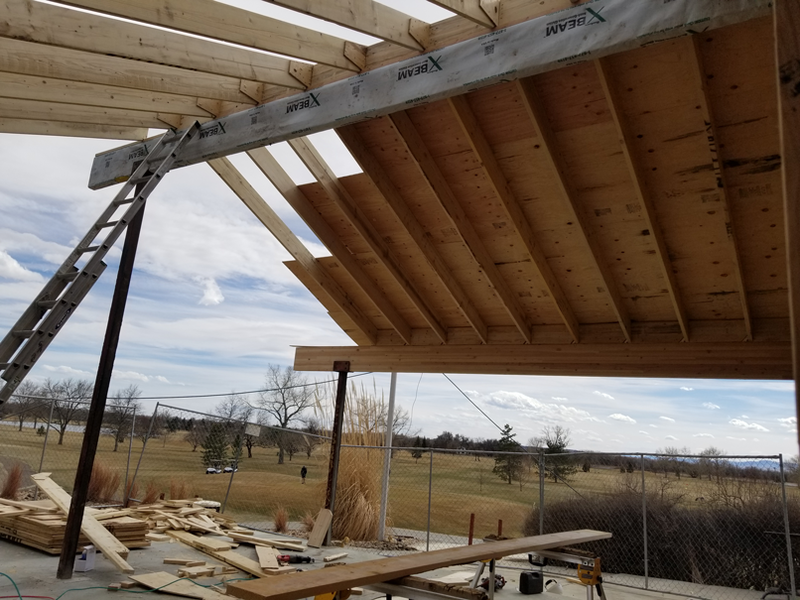 We have insulated the exterior wall, started the drywall, flooring in pro shop, started the tongue and groove under the patio, and started the hood installation. Monday we are scheduled to finish the hood installation. They will have a crane out there Monday morning to install the roof piece of the hood. Drywall is scheduled to be completed by Wednesday, and will then start painting. Completed the rough electrical this week, and rough electrical inspection has passed. This week we have also been able to complete the truss repair around the hood. Next week we are scheduled to start insulation, drywall, flooring install, patio ceiling wood, and hood install. The insulation is scheduled for Monday and drywall will start on Tuesday. This week was able to be very productive. We have completed the lower two offices and hallway carpet. We have started the kitchen tile. Our installer will be there this weekend and will continue into next week. The exterior siding was mostly completed this week, and will continue into next week. Next week we will continue on the tile, exterior siding, and electrical. 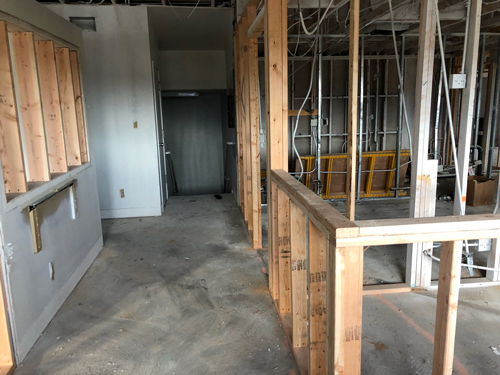 We started the rough electrical, fire alarm system, and the kitchen floor prep. We were also able to get the countertops templated on Monday. Next week we will continue the rough electric. The fire alarm system install will be completed on Monday. Tuesday we are scheduled to have the store front window installed. Wednesday we are scheduled to finish the exterior siding and install the carpet in the lower offices/hall. Thursday we will start the kitchen floor tile. This week we have completed all the bathroom, and lower hallway paint. We also we able to frame one of the kitchen walls in metal for the hood requirements. The new sliding doors were installed. Next week will consist on installing the electrical. This week we were able to finish all of the duct work, and frame in the patio bar wall. The HVAC is now ready for a rough inspection. Next week we are scheduled to have the lower two offices and the upstairs bathrooms painted. We will also start prepping the concrete floor to remove all the old adhesive. This week we were able to paint all the exterior that we could until the remaining siding is installed. This weekend our HVAC crew will be installing all the duct work. We plan on having most of the HVAC completed this weekend. Next week we are scheduled to frame up the patio bar, and continue the siding around the bar. If any HVAC work is not completed this weekend we will finish it next week. 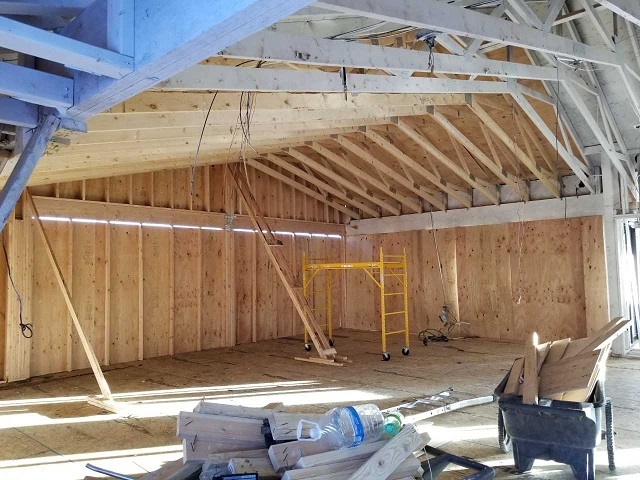 We were able to replace the entire roof and rough framing. Next week we are scheduled to finish the patio bar wall, and start on the HVAC towards the end of the week. We are also scheduled to start the exterior painting. able to complete 90% of the exterior patio. have the rough framing completed this weekend. inspection is scheduled for next Monday. Once the inspection passes we are scheduled to start the roof on Tuesday. The roof will take about 3 days. Once the roof is completed we will be able to focus on the interior. Starting to building the HVAC ducting. Last week the concrete was removed and replaced. The plumber and the electrician ran their rough lines when the concrete was removed. 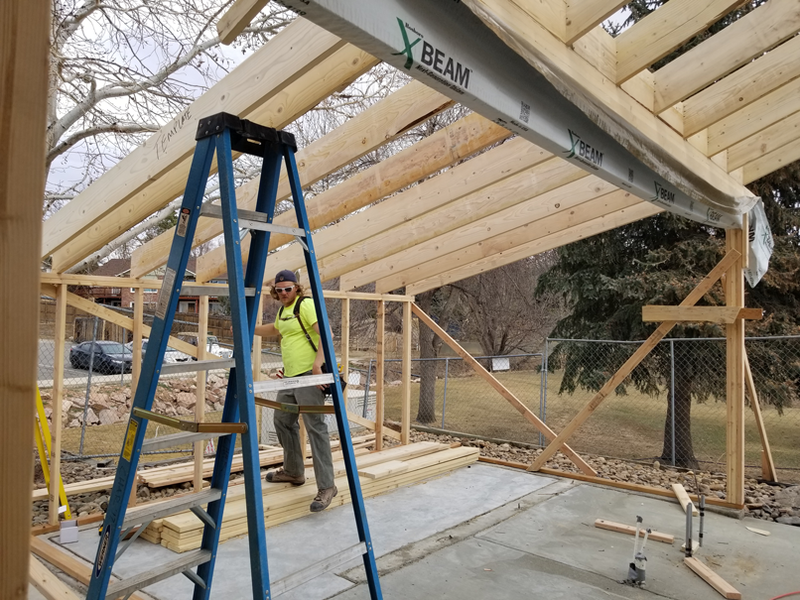 The framers are scheduled for Monday, March 5th to start the patio cover and will be there at least 2-3 days. The patio and bar area is scheduled to start framing on Tuesday, March 6. Once the framing is completed the damaged siding will start to be replaced. That crew will be there March 6 - March 9. The HVAC has been approved to start the week of the 12th. This week we were able to complete the remaining sheathing on the roof. We also installed tar paper on the roof to help dry it in while we wait for the shingles to be replaced. 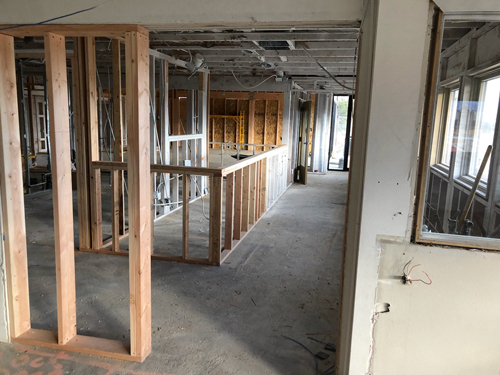 Week of the 29th , we will start on the interior framing. That will consist of the door between the pro shop and kitchen, reframing the bar top, and reframing the closet. October 28th - Fire occurred. 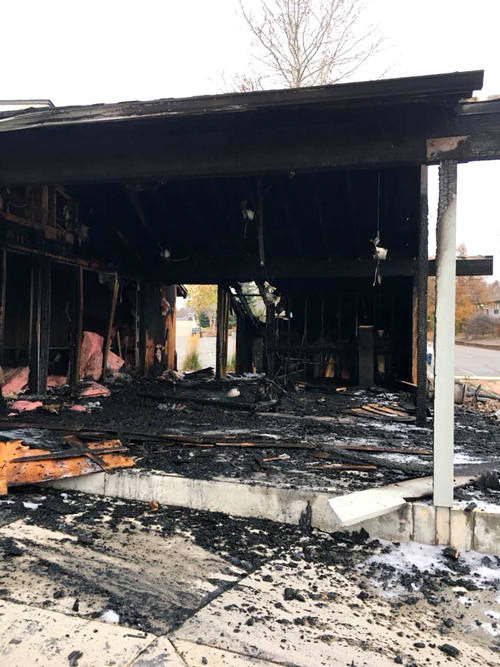 October 28th – The City contracted with All Phase Restoration for mitigation of Fire Damage. All debris from the fire has been removed, excluding damage done to roof in the dining hall. Cost of this work was nearly $60,000. This was covered by the City’s insurance. October – December - Staff worked with Insurance Claims Specialists. 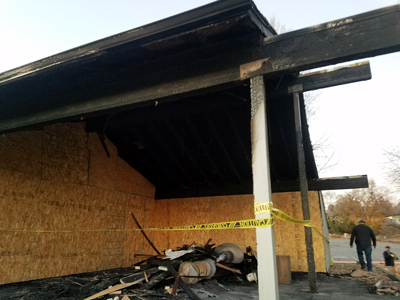 Late December – City’s Insurance defined the cost to restore the Clubhouse at $231,000. December – All Phase was contracted to complete the restoration of the Clubhouse. City Staff and Keith Martin participated in four design meetings with All Phase. January 9th – City’s Building Division approved work to begin on the dining room roof. 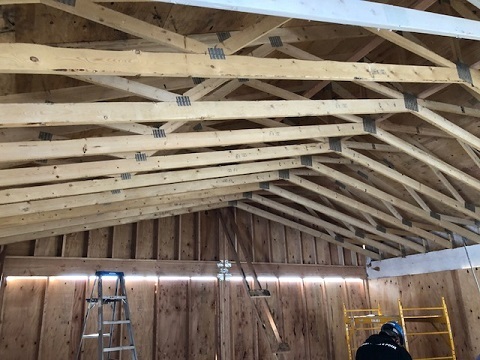 Seven trusses need to be replaced. The new trusses have been delivered to All Phase. All Phase is currently working on HVAC and Electrical drawings that will need to be approved by Building inspection. Hoorah! We are operational once more, though services are limited. We have two portable toilets outside and a red check-in trailer down by the golf carts. The clubhouse is closed until further notice, but you may see volunteers and construction crews heading in and out for cleaning and refurbishing. 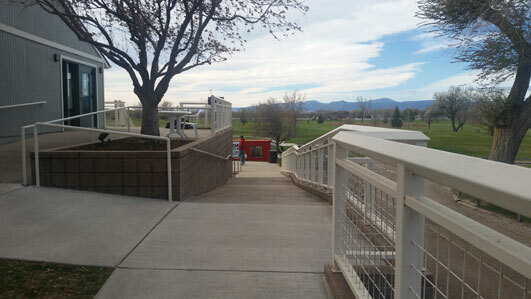 Please bypass the clubhouse and head straight down to the red trailer on the west-side ramp to start your round. As always, to get the best prices, book your tee time online at https://www.golflongmont.com/twinpeaks-tee-times. Great news! ⛳ Twin Peaks Golf Course will be open on Wednesday, November 1 starting at 8:30am. Our golf staff will be operating out of a portable trailer while the Clubhouse is closed. There will be portable toilets outside but limited services available at the course because of the clubhouse closure, so plan accordingly. Customers will be able to book a tee time through GolfLongmont.com for Wednesday or into the future after 8:30am. For those who want to get out first thing Wednesday morning after the frost clears, you are welcome to drop-in and register in-person or call the Twin Peaks Golf Course at 303-651-8401. Phones will continue to be routed to our Recreation Services staff until Wednesday morning. For more information about our courses and to book a tee time online, please visit the Twin Peaks booking engine or follow us on Facebook and/or Twitter. Twin Peaks Golf Course will remain closed on Tuesday, October 31 due to a recent fire, but we hope to reopen on Wednesday, November 1, especially since it is supposed to be a beautiful Colorado 70 degree day! Come support Twin Peaks as we rebuild our clubhouse. For updates, check this page and follow us on Facebook and/or Twitter. Due to a fire early Saturday morning, Twin Peaks Golf Course and Clubhouse will be closed Saturday and Sunday, 10/28 & 10/29. We are working to get operational as soon as we are able. Thank you for your patience. All calls to the Twin Peaks Clubhouse are being redirected to our Recreation Services staff. Remember, both Ute Creek and Sunset Golf courses are still open as weather permits. Please visit our home page to check available tee times. Update as of 6:15pm 10/28/17 - Investigators have finished on scene and while the cause is still undetermined, it was likely an accidental electrical fire. At approximately 4:35 this morning, fire crews were dispatched to a fire alarm at the Twin Peaks Golf Course clubhouse. The first unit on scene found the east side of the building fully involved and quickly called for more resources. This photo shows the heaviest damage to the outdoor pavilion area. There was also smoke and water damage to some interior areas of the clubhouse. The fire was contained in under an hour and there were no injuries. Investigators are on scene to determine the origin and cause of the fire. The golf course will be closed until at least Monday morning. Please check back for updates.